Chef’s Notes: One of the most remarked upon elements on The Kitchen stage on a nightly basis is the copious amount of fresh cut butter lovingly placed in a large ceramic bowl for the night’s service. “How much butter do you go through?” “Is that all for one service?” usually followed by the statement of, “that’s why it tastes so good!” This all leads us to the start of our late summer menu, Hawaiian Butter Snapper basted with, what else, butter. Served atop a silky smooth cauliflower and apple puree, dotted with golden Parisian gnocchi, and kissed with a summer corn jus, definitely hand me the butter. Chef’s Notes: Many of the dishes we think of as “classics” are actually variations on much older creations. Handed down and reworked through fashion, culture, and sometimes politics and conflict, their names begin to change in meaning and expectation. Our idea of the modern Steak Tartare is in fact closer to a dish known as Steak a la Americaine, though over time the two have merged. Well, here we go again. We have decided to take a different approach with our tartare and slice our prime beef thinly, forming a carpaccio with all the accompaniments one would expect. And, as a nod to new “classics”, we are serving ours with duck fat French fried potatoes tossed in truffles. Here’s to the new guard! Chef’s Notes: As Mae West once said: “The intent is simple, pamper me and indulge my whims.” For our next course we are going to take this literally. It begins with our smoked Pekin duck breast set aside nutty wild rice braised in rich roasted poultry stock and sauced with a coulis of golden raisins and coriander. Then we top it all with peeled and glazed Peony grapes, resulting in a late summer flight of fancy. Chef’s Notes: It has many different names: Escalope, Milanesa, Parmigana, Chuleta, etc., but they are all Schnitzel. It would seem that there is a worldwide love affair with the dish of breaded cutlets, so we thought we’d heat up the pans and add our own to the list. At the heart of it is brined heritage pork filet coated with mixture of crispy prosciutto and chicharrones, sauteed to a succulent peak. Served alongside fresh late summer butter beans and charred radicchio, and all sauced with a rich dried tomato beurre blanc, we can see why this dish crosses so many boundaries. 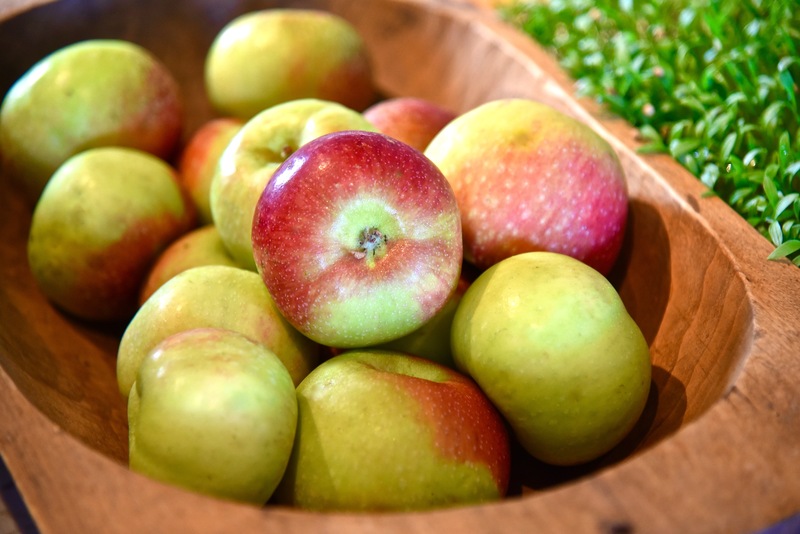 Chef’s Notes: For many it could be said that apples are most associated with fall. However, September is the prime season in our area for this most noble of fruits. Our foothills are filled with orchards bursting with heirloom varieties, and we couldn’t be happier. We begin with these gifts of the season, baking them into a delicate galette topped with a brown sugar and oat Chantilly cream and honey roasted pecans. What better way to close out our menu as the nights start to cool. Bon Appetit!